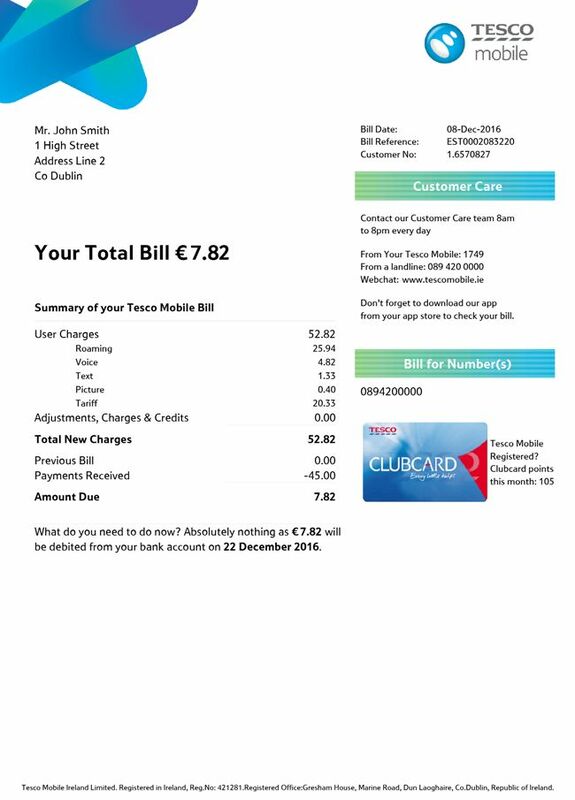 This is an interactive Tesco Mobile Ireland phone bill. Simply click on a number to reveal the information for that section. Name and address of the account owner. Bill Date: The date your bill was generated. Bill reference: This is a unique code for this bill, each of your bills will have a different code. Your customer no: Customer account number. This lists all the phone numbers on your account which will appear on your bill. If the phone number is a Prepay number then no usage will be listed or charged, it’s only displayed because it is included on your account. These are the potential Clubcard points your bill has earned you. You will only have earned these points if you have registered your Clubcard with us. To find out how to register, click here. All usage for all phone numbers, outside of bundle allowances. Includes tariff charges, as well as any credits. This will be totalled at the bottom. The previous bill amount is shown here. And directly below is any payments received. On your first bill, this includes your initial payment. On subsequent bills, it will show your previous month’s payment, as well as any manual payments that were made. This part of your bill explains where each of your charges are coming from. This will show you the cost of each activity you have made which is not included as part of your monthly free bundle allowance (these include all non-Irish mobile/landline calls and texts as well as additional usage once you have used all of your free bundle allowance). In this section you will see a summary of the charges associated which each number on the account, what tariff each number is on. 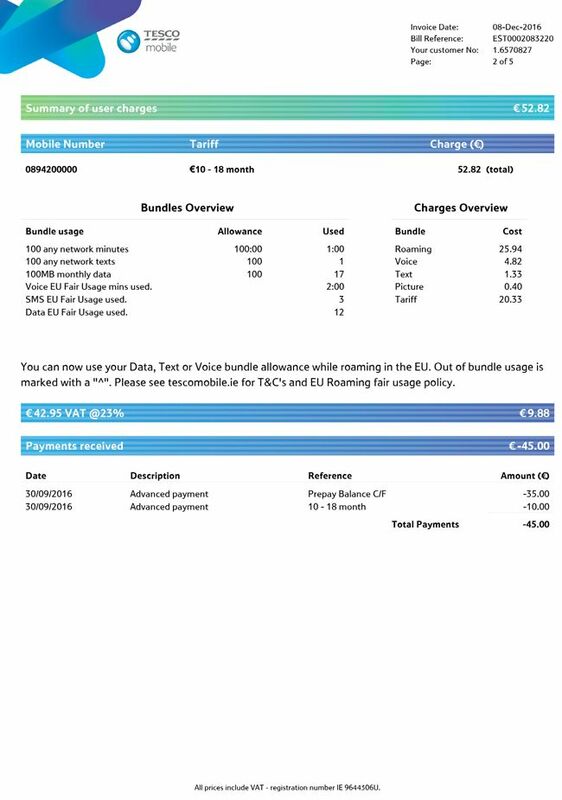 This gives a summary of your bundles, both the included bundles with your tariff, and any extra bundles you’ve added. It also includes the allowance and usage for each of your bundles. Your monthly bill charges are displayed including VAT, the current VAT rate is 23%. This section details all transactions related to payments and the date on which they happened. Should any of your bill payments fail, these will also show in this section of your bill and will appear as a successful payment followed by a failed payment on the same day. Any manual payments made by you through Customer Care will appear in this section of your bill. *Please note that manual payments that you make could take up to 5 working days to process*. This section highlights which phone number the following usage is related to. If you have more than one phone number on your account, each number will be listed individually on your bill, but all phone numbers will be included in a single bill for your account. This section includes the total charges for your phone number(s) which is a combination of the subscription charges/line rental and any additional chargeable usage. 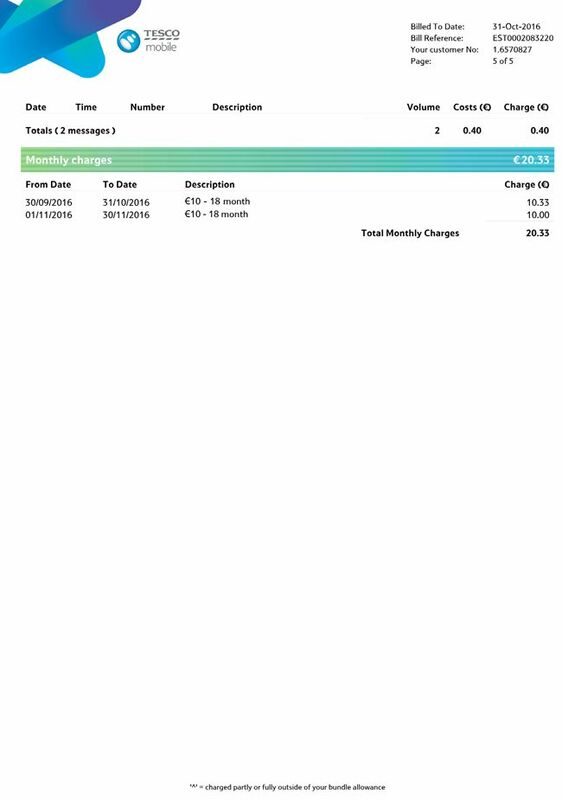 This section shows the total cost of all your calls/text/data. In bundle charges can be identified by the symbol : (^). Rates for using data while roaming depend on which country you are in, for more information click here. 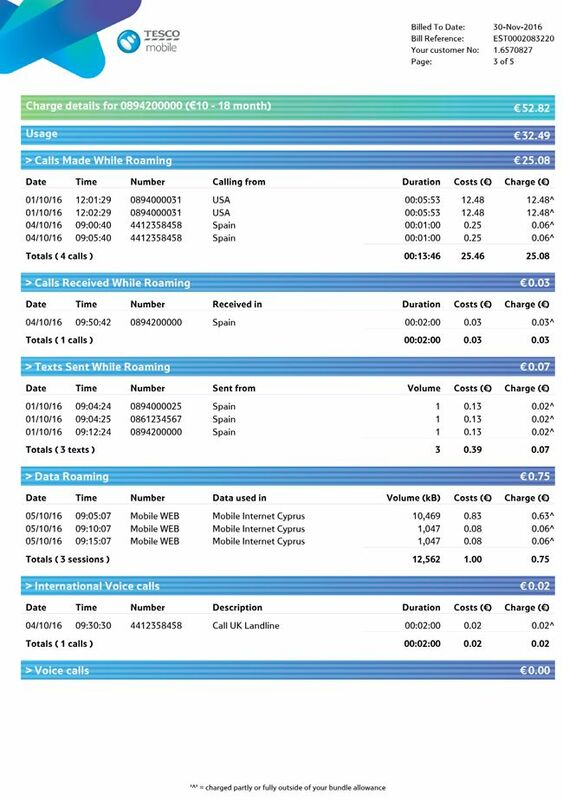 These are calls made to any number outside of the Republic of Ireland, and are charged per minute, for more information click here. Calls which appear on the bill starting with "TMI to" means that they are calling someone on another Irish Network. These calls are included in your bundle allowances and are only charged if you have exceeded your allowance. 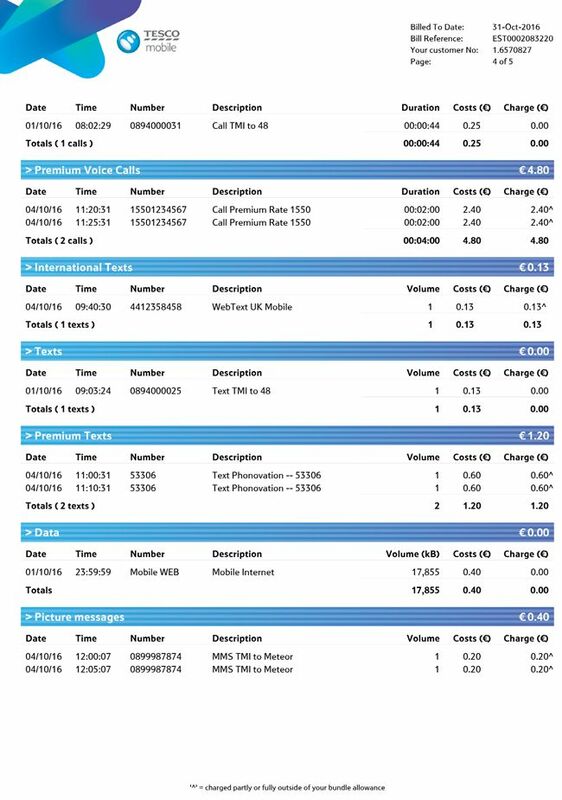 Calls which appear as "TMI on-net" mean that they are calling someone on our network and are free. These are texts made to any number outside of the Republic of Ireland. These are texts made to phone numbers within the Republic of Ireland. These texts vary in charges. They charge in a variety of ways: some charge when you send the text, others charge when you receive a reply text. Charges vary and are decided by the company you are texting. This shows the amount of internet usage per day, and the related cost whether it is included in your bundle allowance or if you have exceeded this allowance and will be charged for the additional usage. These are MultiMedia Messages which may include picture or audio messages that you have sent from Tesco Mobile. This details 3 different charges: Your current monthly charge, the payment received from your previous bill for the advanced month payment, and the charge for next month’s subscription. On your first bill, the current monthly charge will show the prorated subscription charge and the exact dates that it covers. Should you change plan, or add/remove bundles during your billing cycle, there may be additional lines on your bill which will reference your old price plan as well your new price plan. These will be prorated for the dates of activity on each change. Just remember, this is an example bill, so the rates shown are for presentation purposes only and may not be the same rates that appear on your bill. For a detailed explanation of Pro-Rata, please click here.